SealMaster Acrylic Low VOC Traffic Paint is a user friendly, fast drying, low VOC acrylic/acetone based traffic paint. May be used to stripe roadways, airports and parking lots with or without pressure applied glass beads. This product meets A-A-2886 (B) Type 11, WA DOT Specification 9-34.2(4) for Low VOC acrylic/acetone based Traffic Paint. 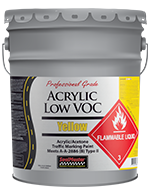 SealMaster Acrylic Low VOC Traffic Paint is a user friendly, fast drying, low VOC acrylic/acetone based traffic paint. May be used to stripe roadways, airports and parking lots with or without pressure applied glass beads. This product meets A-A-2886 (B) Type 11, WA DOT Specification 9-34.2(4) for Low VOC acrylic/acetone based Traffic Paint. All surfaces must be clean, dry and free from oil, grease, antifreeze, loose sand, aggregate and chipping/peeling existing striping. Any curing compounds used on new concrete must be mechanically abraded off prior to striping. Stir thoroughly before using. Do not thin. Apply with spray equipment, brush, or roller to properly cleaned and prepared surface. Typical tip sizes for “airless” machines are .019”-.021”. Do not heat paint in striping system above 140° F. Do not apply when temperatures are below 38° F. Do not apply when rain is forecast. Do not apply when temperatures are near or below the dew point or rain is forecast within 1 hour. Product reduces and cleans up with acetone.